Lack of diagnostic capacity is a crucial barrier preventing from an effective response to the challenges of TB-HIV and drug-resistant TB (DR-TB), with less than 8% of the estimated burden of DR-TB patients currently being detected. Several operational research studies conducted in different settings have shown that lack of laboratory capacity is the main bottleneck also for the surveillance of resistance to anti-TB drugs (DRS), whereas estimation models and projections have confirmed that an effective response to the diagnostic challenges of TB-HIV and DR-TB requires urgent and massive scale-up of laboratory services. However, establishing, equipping, financing, and ensuring sustainability of appropriate laboratory networks are challenging, complex and expensive. Hence, strong and tailored interventions to expand TB laboratory services are needed and address different tiers of laboratories with different levels of testing. Towards these aims, the TB Supranational Reference Laboratory Network (SRLN) was created in 1994 as a sub-group of the WHO/Global Laboratory Initiative (GLI) in order to support the WHO/IUATLD Global Project on TB drug resistance surveillance and with the objectives to estimate the magnitude of drug resistance globally and provide data to inform WHO policy decisions. Since 1994 the SRLN continues to be a key technical resource in support to the strengthening of the laboratory capacity in countries. 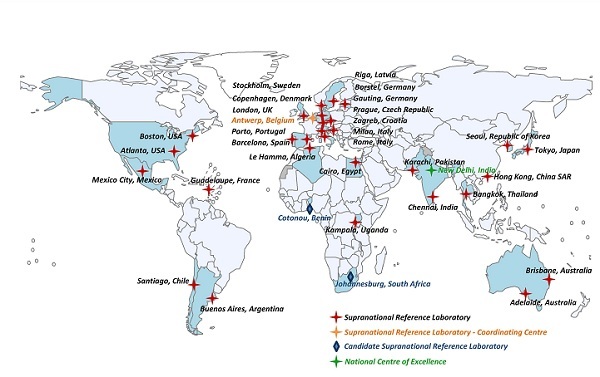 Under WHO coordination and support, the SRLN network has expanded from initial 14 to actual 30 Supranational Reference Laboratories (SRLs), 2 Candidate-SRLs, and one National Centre of Excellence, largely driven by regional initiatives and institutional interest in joining the WHO SRL network. Since 2010, new Terms of Reference as well as new Eligibility and Inclusion Criteria for the SRLN have been developed. Formal collaboration agreements (English, French) now need to be established between the SRL and the National Health Authority or Ministry of Health acting as TB Reference Laboratory at National level (NRL): each SRL is linked to at least two NRLs and hence represents the preferred technical partner for laboratory scale-up and capacity development in countries, playing a critical role in strengthening national laboratory networks as a well as surveillance systems to monitor drug resistance. Improved co-ordination of technical assistance provided by the SRLs remains a key priority for the network. To this aim, a Global Repository of technical reports from the SRLs and collaborative Partners has been established and is publicly available, which should constitute a key instrument for the coordination and continuous monitoring of SRLN activities globally.